Nigeria No 1 Gospel Music Website. 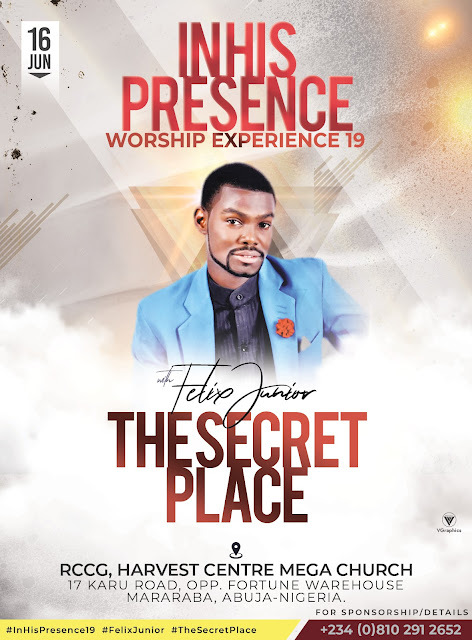 Home / Event / News / Felix Junior Announces In His Presence Worship Experience. Felix Junior Announces In His Presence Worship Experience. Felix Junior is an Abuja base gospel music minister set out in 2018 with what can be described as "a gathering of desperate people to be blessed & be refreshed in the spirit". Concerning the event "we trust God Almighty that this year will be bigger than last year's IN HIS PRESENCE WORSHIP EXPERIENCE. We are putting a lot more prayer time, seeking the face of God for his Shekinah Presence, that everyone that comes into the venue on that day Will go back receiving something tangible from the Lord. The Lord will be Glorified in us and through us. Felix Junior." PLAN, PREPARE AND PRAY TO BE THERE.